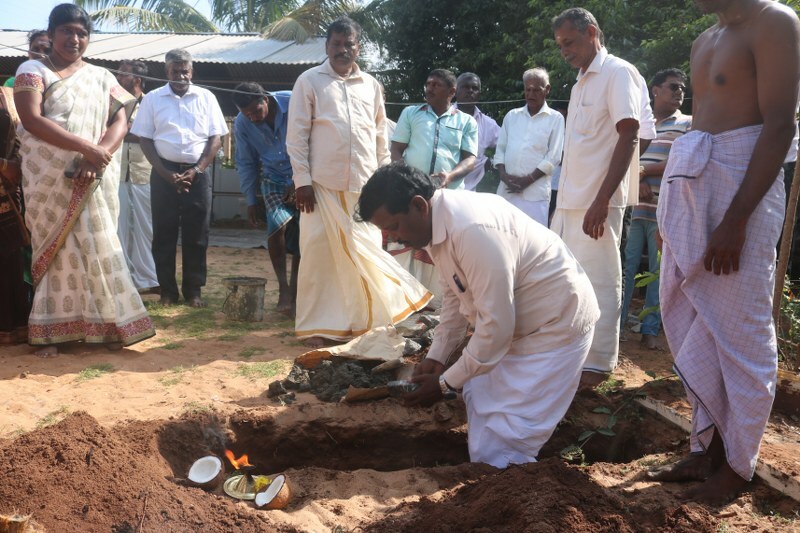 A Sinhala Buddhist monk is attempting to rewrite and erase the history of a Tamil Hindu temple in Mullaitivu, former Northern Provincial Council (NPC) member T Ravikaran has said. Ravikaran was summoned for questioning by Mullaitivu police on Sunday, following a complaint by a Buddhist monk who has led the construction of a Buddha statue encroaching on the Neeraviyadi Pillaiyaar Temple premises in Semmalai, Nayaru. The complaint was regarding the digging of a foundation to restore the Hindu temple. Speaking to media after his enquiry with the police, Ravikaran said he had attempted to set the record straight about the Hindu temple which had existed for generations before the Buddhist monk’s colonisation project. “On January 14, 2019, Tamil people of Neeraviyadi hill of Nayaru which falls under Semmalai East GS division held special prayers at the Pillaiyaar temple. I too participated in the prayers. Following the prayers, the foundation for the temple was laid. Today, I was called on for enquiry regarding the complaint made by the Buddhist monk who is sitting in Nayaru. During the enquiry, I informed the police that I participated in the event since I was invited by the temple administration as a representative of the people. I also informed them that it was an ancient Pillaiyaar temple that was in existence at Neeraviyadi hill. I also mentioned that there were no Buddhist religious marks or any other religious marks other than those of Saivism in that place. Hence, the stories of supposed existence of Buddhist religious marks in that place cannot be accepted, I clearly stated. The area has seen ongoing tensions for months, with a Buddha statue which local residents and authorities say was built illegally hastily opened before a court case challenging its construction took place.